Ibrahim Halawa, jailed for over two years, faces a third birthday in prison as fears for his health rise. "I write with a ticking clock closer to my death. For the past two years and three months I have been imprisoned unjustly. I am waiting for my turn on the death rope. My only crime is being innocent. I have waited for the Egyptian government to prove otherwise but it hasn't." Those were the words scribbled down last month in an Egyptian prison by Irish teenager Ibrahim Halawa, as he began a hunger strike. 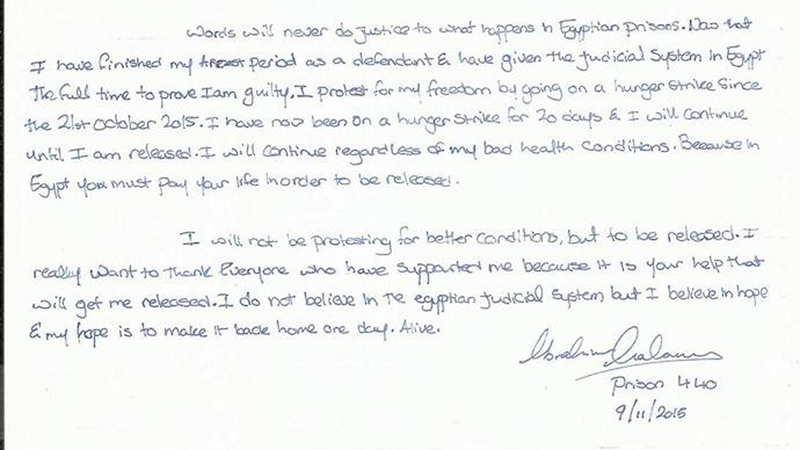 He turns 20 today, the 849th day of his detention, his third birthday in a cell. Two-and-a-half years ago, he had just completed the penultimate year of high school and was eyeing an aviation engineering degree. He was an ambitious, rap music-loving student heading to Egypt, his parents' country of birth, for a summer holiday. On Tuesday, his ninth court hearing is due. The mass trial, which has been postponed and adjourned for more than a year, is to be attended by 493 other defendants but there are concerns the date might again be moved further forward. In any case, "the sheer number of people involved in Ibrahim's trial renders any concept of due process or the right to a defence meaningless," according to Reprieve, a UK-based rights group that campaigns against the death-penalty, a punishment that Ibrahim could face if convicted. Arrested in August 2013 along with hundreds more, the tall, crop-haired student is on trial for an alleged role in violence during protests in Cairo - charges he, witnesses, and his lawyers all deny. 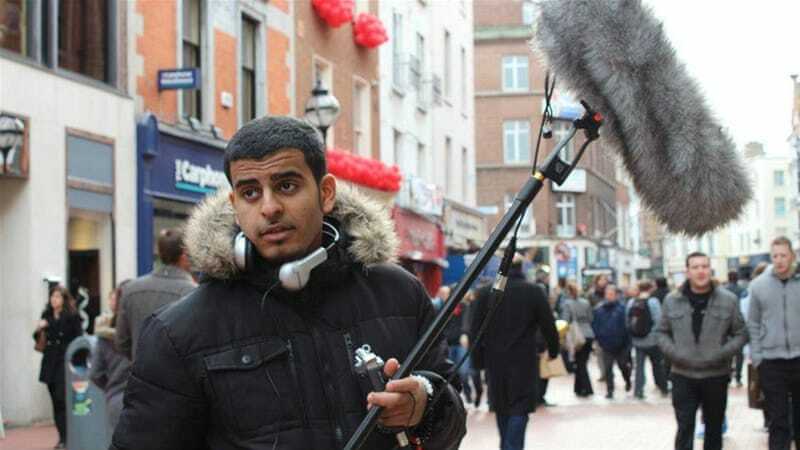 The recent hunger strike has alarmed Ibrahim's family, human rights organisations and those who have shared a cell with him; their greatest fear is that the Irishman - who suffers from depression - is close to suicide. Recounting August 17, 2013, the day of their arrest, Ibrahim's 28-year-old sister Somaia says: "We went to join a peaceful protest against the Rabaa massacredays earlier, where 1,000 people or so were killed. At 5pm we reached Ramses Square but there were police officers and thugs on the other side. Every time we headed to a different street there were more, and they were shooting at us. To avoid this, we went to the al-Fateh mosque." The mosque, which had become a makeshift morgue, was also under siege. As security forces circled the place of worship packed with hundreds of people, Ibrahim huddled around Somaia and his other sisters, Fatima and Omaima. "As we entered, all we could see was dead people around us," she says. "When we saw that the media was present, we felt calmer and safer. There was a feeling that no one could attack the mosque. But as soon as the media connection was lost, they attacked." A rush of tear gas, live fire and rubber-coated steel bullets hit the mosque. Ibrahim was shot in the leg and hand - injuries which to this day have not been properly treated. "Ibrahim had us surrounded in his arms. Everything was going to hit him first in the back. He was trying to protect us, even at 17," says Somaia, who later fell unconscious from the tear gas and shock. The siblings slept in the mosque overnight. The next day, they were all arrested and taken to a military camp, later to be moved to prison. The sisters were released on bail after three months and returned home to South County Dublin. Ibrahim has since languished behind bars in several prisons, where he has reportedly been beaten and electrocuted. He is currently at Wadi el-Natrun prison. Colm O' Gorman heads Amnesty International in Ireland and is among the activists campaigning for Ibrahim's release. "I can understand why he would be feeling abandoned and forgotten and hopeless," he says. "He's seen his life wasting away in front him. I can only begin to imagine the level of trauma. I know his family is frustrated, they have been through extraordinary torment. They have occasional visits but are left powerless." Ibrahim's father, Sheikh Hussein Halawa, is the Republic of Ireland's most senior Muslim cleric and the imam at the country's biggest mosque, in Clonskeagh. Scared that Egyptian authorities might target him, he remains in Ireland and has not seen his son for over a year. Ibrahim's mother is able to visit weekly, but meetings are short and impersonal with several other people cramped in the visiting area at the same time. Somaia says their mother "sees him behind two wired fences" - a vision which has further depressed Ibrahim. "He has said in a letter that he can see mum crying and that he knows she's upset because she can't touch me physically," adds Somaia, who has put her master's degree on hold to campaign for his release full time. "It will be no surprise to anyone that Egyptian prisons are pretty difficult places," says Amnesty's O'Gorman. "The kid just wants to come home. He's clearly an Irish citizen and that brings a complexity to the case." The people that know Ibrahim say that at 17, he did not have political ideas. Days before his arrest, he had been visiting tourist sites and unlike his sisters, he hadn't attended previous rallies. He is not a dual citizen. He is an Irish passport holder who paid for his visa on arrival. "His mother tongue is English, he learned to speak proper Arabic in prison," saysBaher Mohamed, an Al Jazeera journalist who happened to end up in a cell with Ibrahim. They shared a space for around six months, along with Peter Greste and Mohamed Fahmy, the other journalists with the network accused of spreading "false news" during their coverage of demonstrations protesting the military overthrow of President Mohamed Morsi in 2013. Mohamed says he felt protective of Ibrahim, who was excited to be able to speak in English with the journalists. Describing him as noble, decent, kind, stubborn and a pacifist, he recalls their time together as sometimes desperate. Though the particular institution they were jailed in together, Al Masra, had slightly better conditions, they were traumatised by recent experiences in other prisons: Insect infested and cramped sleeping conditions, solitary confinement, little - sometimes rotten - food being served, aggressive guards, no fresh air, poor quality uniforms that caused allergic reactions, no exercise, and regular lockdowns including during festive periods such as Eid. "Sometimes he used to say: 'My country is not doing enough for me.' We saw what the Australians did for Peter Greste. He saw that with his own eyes and he didn't feel the same support. At some point, he was thinking of committing suicide. He said: 'My country is not doing anything for me. I'm living in this situation - why should I live?' It was scary," says Mohamed. On his 19th birthday, Mohamed and Greste baked a cake "with green things on it to represent Ireland", Mohamed says, pronouncing Ireland with an inflection, as the teenager likely would. Mohamed was freed in September this year after a presidential pardon, along with Fahmy. Greste was released in February, news which Ibrahim celebrated genuinely, without envy, Mohamed says. As the date for his next court hearing approaches, hopes swell that Ibrahim may be released. But Egypt's rate of mass imprisonment and the imposition of draconian measures show few signs of abating. Arrests have increased since July 2013, when Morsi was toppled, clearing the way for Sisi to take leadership. Around 600 people were sentenced to death in 2015, more people are actually being executed, and at least 15 mass trials have taken place since March 2014, Reprieve has found. Human Rights Watch has said that between July 2013 and May 2014, under President Abdel Fattah el-Sisi's leadership, authorities "detained, charged, or sentenced at least 41,000 people ... straining Egypt's prisons and aggravating hugely overcrowded conditions". Indeed, Egypt's prisons are so overcrowded that the cabinet this month approved for 40.5 hectacres more land to be used to build new facilities. Back in Ireland, Codie Preston, one of Ibrahim's science teachers, finds it difficult to explain injustice to children. "Ibrahim's former teachers and schoolmates are very concerned about him, and often talk about him and ask has he been released yet," he says. He added that the Irish government's response was "appalling and their silence is disappointing. "We will all be thinking of Ibrahim on his birthday and praying that he will finally get justice and be allowed to return home to his family, go to university and be the positive citizen he can be."